Ladies watches were seldom reviewed on my blog, I think ladies are more likely to see beautiful photos other than these boring words. 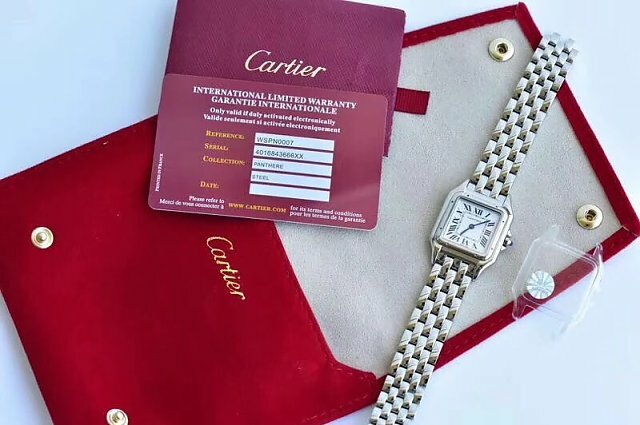 But there are certainly factories that have made some high quality ladies replica watches, such as 28mm Cartier Ballon Bleu from V6, Rainbow Daytona, etc. Ladies who love big-size watches can also choose some great models from our Panerai category. 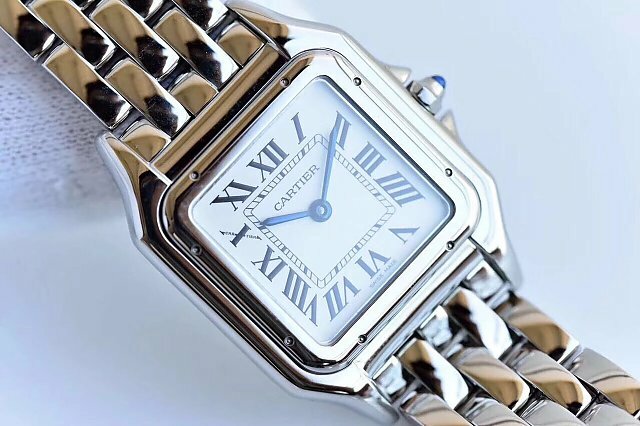 Today, I want to introduce another Cartier replica watch, not the popular Ballon Bleu model, it is Panthere de Cartier. 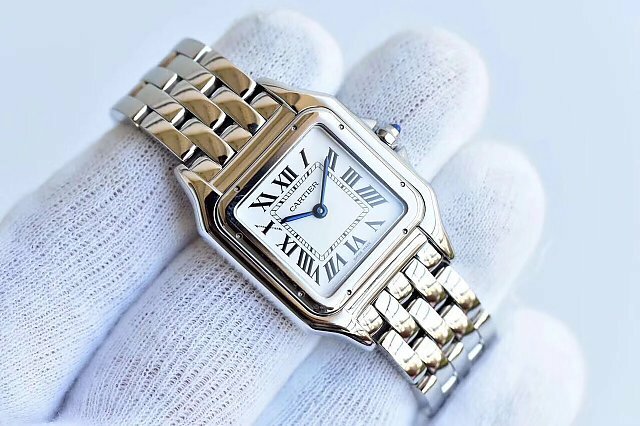 Panthere is the symbol of Cartier and it has a special meaning, if you want to give your girlfriend a Cartier watch that inherits the most original DNA of Cartier, then Panthere de Cartier will be a good choice. 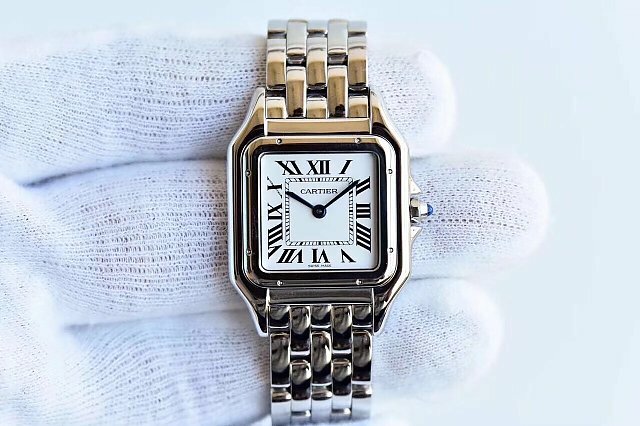 Now back to school season is coming, it is a good idea to send your girl such a replica Cartier Panthere watch as a gift, the replica is not only an accurate timer, but it also reflects her elegance. 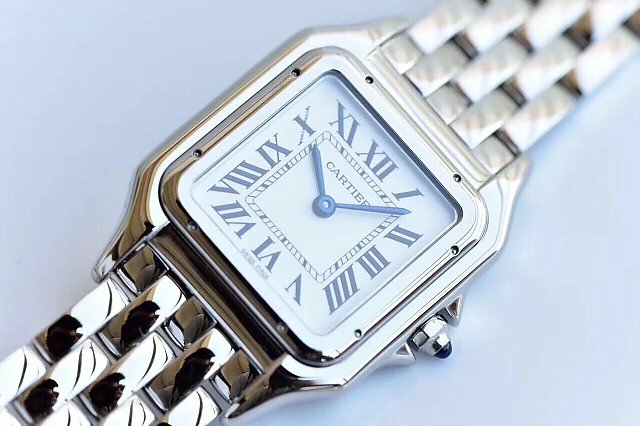 The Panthere de Cartier has a square case that is like Santos. The case is in size of 27mm*37mm and measured to be 6mm thick. It is polished and has eight screws decorated on the bezel. 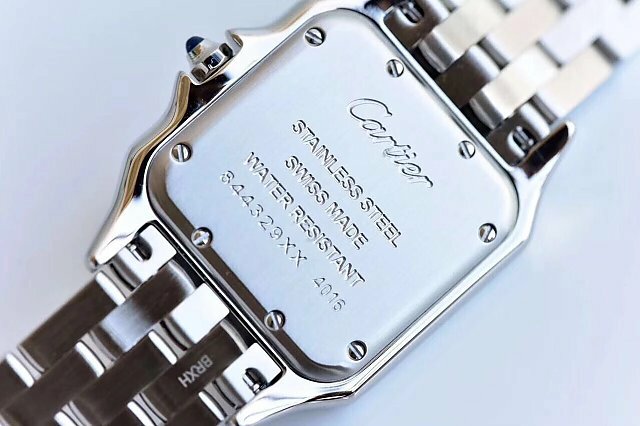 Compared with the case of Cartier Santos, Panthere has its own features, check the lugs, they are naturally extended from the case, together with bezel, the whole case is one-forged piece. Case back is made of solid 316L stainless steel and has correct engravings like genuine watch. Crown is small but looks very delicate, it has a blue spinel sapphire embeded. Dial is white and hour markers are black Rome numerals, blue steel sword-shaped hands add elegance to the replica watch. Minute scales are marked on the center of the dial, in a square. There is no second hand on the dial. Like genuine watch, the marker at 10 o’clock has a declining “CARTIER” lettering. About the bracelet, every link is polished well and the whole bracelet looks very shiny. The clasp on the bracelet is deployant style. 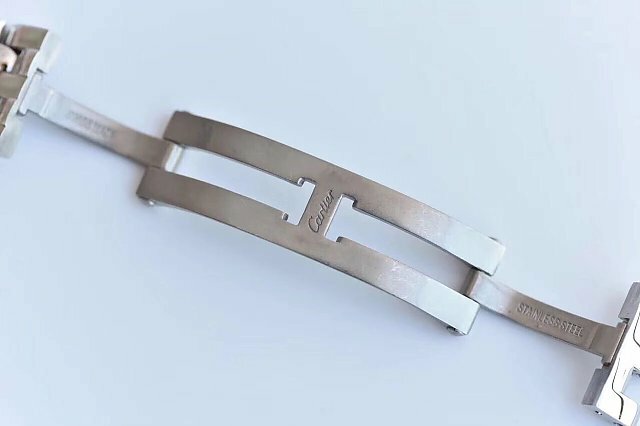 Each end of the bracelet is connected to the case through pin, do not worry, the two pins are fixed firmly and will not fall off. 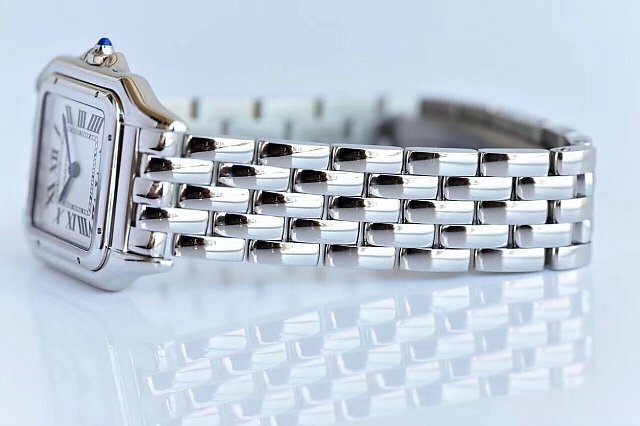 The bracelet is made of solid 316L stainless steel, it is finished in high quality has a similar weight to genuine Cartier Panthere watch. 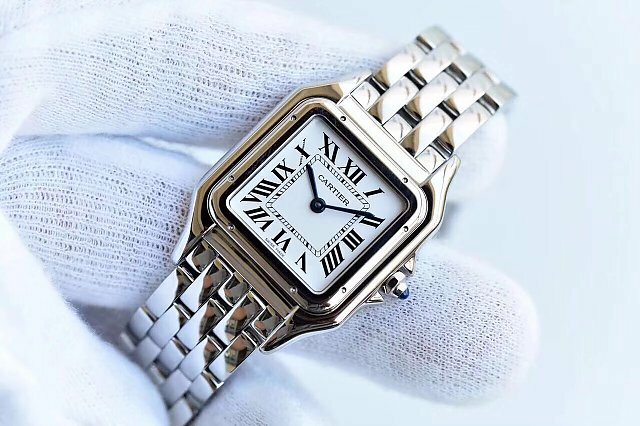 Now, buy this Cartier replica watch and we will send you one original Cartier box for free. 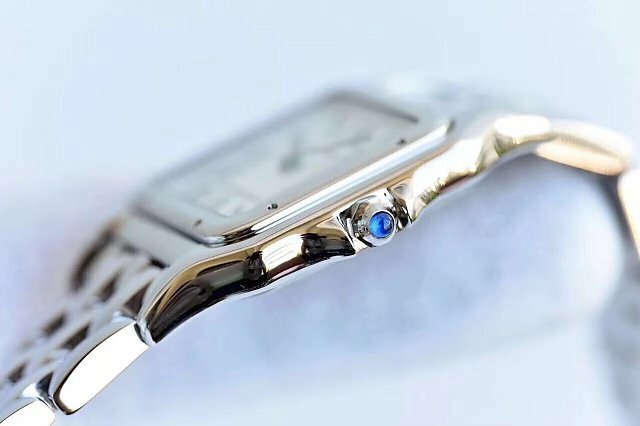 By the way, the movement inside the watch is Swiss Ronda, whose lifetime can last for three years, which means you do not need to replace the battery until three years later. Price and shipping means? and how do we pay?